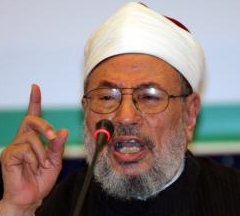 July 23, 2013 Doha: Noted Islamic scholar Dr Yousuf Al Qaradawi (pictured) has denied that he has been expelled from Qatar, and said some media reports suggesting this are false and malicious. Pooh-poohing reports in sections of the media, he said he had returned to Qatar even while they were still busy spreading propaganda against him in order to show that he had strong ties with the country and its people. At Al Jazeera’s weekly call-in programme ‘Shariah and Life’ last Sunday, a viewer asked him why he had left Egypt on the eve of the ‘military intervention’, on June 30. In reply, he said: ‘As some sections of the media began spreading propaganda against me that I had been expelled from Qatar, I came back here to show that those reports were false’. The cleric said that he was not trying to escape from Egypt (after the military intervention). He also criticised the military intervention in Egypt, calling it ‘illegal’ as the army did not have the constitutional right to take action against Mohammed Mursi. On July 6, Al Qaradawi had issued a fatwa urging all Egyptian Muslims to support Mursi and uphold the Egyptian constitution. He had also called on Sisi to withdraw from Egyptian politics and preserve law and order and democracy in the country. Dr Qaradaw’s recent interview has provoked many in the United Arab Emirates, especially on social networking sites, where many are using the ‘Qaradawi threatening Emirates’ hashtag on Twitter. Earlier this month, the GMBDW had reported that the new ruler of Qatar has given Qaradawi a warm welcome, casting doubt on the rumors of his expulsion. One day earlier, we had reported that Qaradawi had issued a fatwa (religious ruling) condemning the deposing of Mohamed Morsi as President and calling on Egyptians to support Dr. Morsi.